It’s easy to forget amidst all the glitz and glamour of AAA games that video games are still pieces of art, but every now and again a game comes along and reminds us of just that. Usually these experiences come from indie developers and publishers who aren’t bound by corporate pressure and instead make games for the love of making games, or should we say, art. That’s not to take anything away from their AAA counterparts who no doubt love making games too, but AAA gaming operates in an entirely different bubble to indie gaming, both expectation and budget-wise. Puzzle games often fall into this category, and some of my favourite games are puzzle games, such as the Myst series or some with a heavier focus on stories like Broken Sword or Syberia. So when I was offered the chance to go hands-on with Etherborn, a puzzler that combines both heavy puzzle solving and story aspects in a unique way, naturally I jumped at the chance. 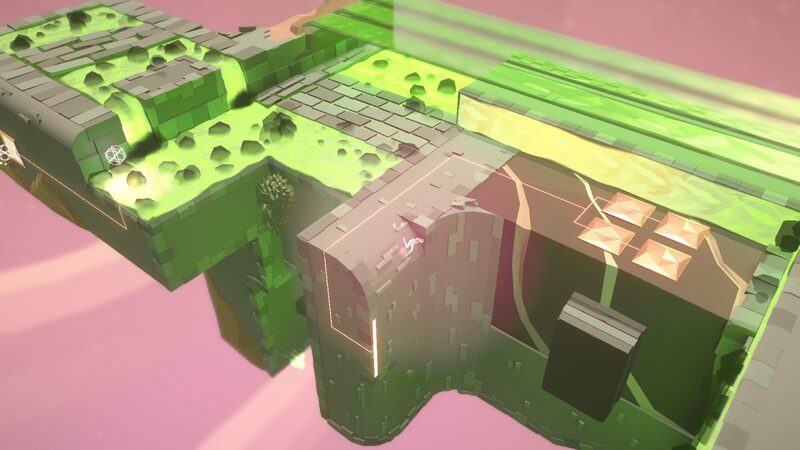 Etherborn is the creation of Barcelona-based studio Altered Matter, who describe the game as ‘a third-person gravity-shifting puzzle-platformer’. The team of four have been working on the project since 2014 when the initial idea was conceived, however the studio wasn’t officially founded until 2016 according to co-founder and Etherborn level designer Samuel Vitali Cohen Kellner. ‘This is our first game together as a professional team. A few of us worked in small local studios before, while others have been making our own personal games since we were like 16’, Kellner says. Etherborn’s premise is simple, you play a voiceless being seeking out a bodiless voice. You must reach the ethereal voice by traversing the gravity-shifting puzzle structures to understand your own existence. It’s a story that goes against the grain in some ways as it is just as much about the destination as it is about the journey. The game’s premise is symbolic of its name, with Kellner explaining that it’s based on the XIX century notion that ether was what filled up the universe. ‘It was also used as an explanation to various natural phenomena, like the travel of light or gravity’, he explains. ‘In Etherborn, you’re a luminous being that has just been born out of thin air, in a strange world where gravity behaves in the most peculiar way. So from there we just put it together and there you go’, he adds. ‘If you ever want to test the limits of friendship and sanity, try naming a game together’, Kellner laughs. When quizzed on why the studio chose to make a puzzle game as their debut game given they are a rather niche demographic Kellner is frank, ‘we’d had this idea of making a gravity-shifting platformer where the tool for puzzle-solving would be your own movement for a while. There’s not a lot of games like Etherborn, so we decided to take a shot’, he says. The gameplay in Etherborn is what makes it such a unique experience. 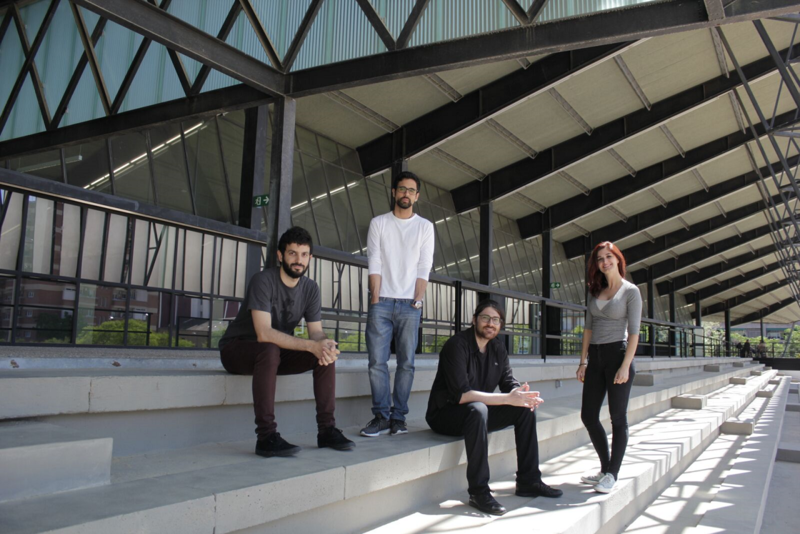 ‘Our traversal system is built around a unique sense of gravity that anchors you to any surface you stand on’, says co-founder and lead programmer Carles Triviño Massó. ‘Moving through the environment becomes the puzzle itself, where each level acts as a sort of organic Rubik’s Cube that you need to explore, manipulate and shift your gravity on in order to figure out the way forward’, he continues. My hands-on demo contained the first four levels of the game, and it didn’t take long for the game’s charm to lull me into a false sense of security. Initially I felt much like the protagonist I was controlling: lost with no idea how to get out. Due to the nature of Etherborn’s environmental puzzles there are no clues that players can hunt for to find the solution, instead players need to explore their surroundings and show tact in order to progress. Etherborn’s puzzles are played out on small maps whose geometry will change depending on your approach. Sometimes you’ll be walking upside down as if practising for the X games, other times you’ll gracefully jump down to a platform that was initially the side of a rockface; it all depends on what is required to progress. Your character can run and jump and must collect orbs that allow access to other sections of a level. The only minor gripe I had with the gameplay is that camera can become awkward at times. Several times I fell to my death because the camera gave me an awkward or obstructed view. It is worth mentioning that players can manually control the camera by using the right thumbstick of the controller, however you’re frequently wrestling with the automatic camera for control. It’s not a deal breaker by any stretch and given the game is in alpha I expect little kinks like these to be ironed out before the game’s release. As I finally made my way across the game’s challenging and shifting landscapes I felt a sense of gratification like I had achieved something, and it felt good man. Puzzlers seldom give that feeling these days; the right mix of difficulty is a tough balance to find, but Etherborn seems to have it bang on currently. Despite the challenging nature of the game I never felt it was unfair, and each time I failed I was more compelled to find the right way forward. It’s a recipe for an addictive experience and one that reminded me of Death Squared by Australia’s very own SMG Studio. The other thing to note is that the game is rocking some truly beautiful visuals. The vibrant colours that paint the world give it a sense of grandeur and this is emphasised by your character’s sheer diminutiveness in comparison to the world around you. 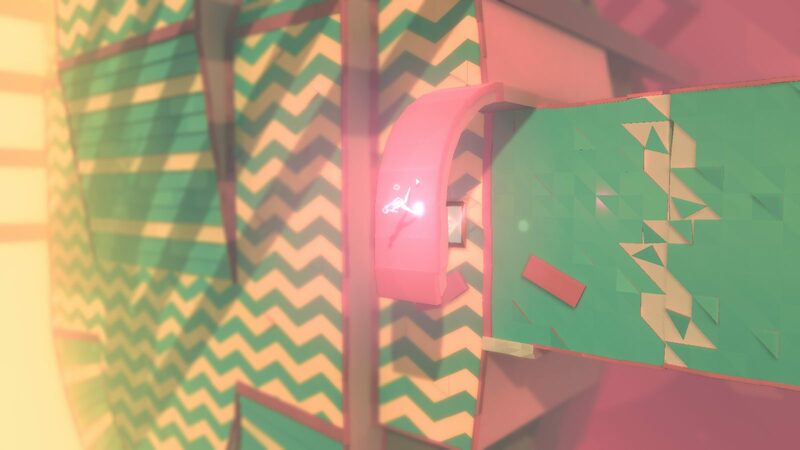 Bright pinks, greens and yellows encapsulate the world, with Kellner stating that this was done to make the players feel like they were discovering the world at the same time as our protagonist. ‘Using colours that are unnatural in our reality allows us to capture this feeling of being in a world that is completely unknown to us’, he says. ‘However, we don’t want to introduce the player to this world in a negative or frightening way (which I guess is how real births usually are), so we tried to set colourful moods too, enhancing the sense of mystery with a positive touch’. Another impressive aspect of Etherborn is its soundtrack, and given that our protagonist can’t talk, music is an important component of Etherborn. ‘While we try to give every element as much importance as possible, music is quite crucial in Etherborn’, says Kellner. ‘Each level of the game has music specifically written for it so we don’t use music just as a filler, but as a tool to enhance the whole experience’. There will be voice-acting in the game though, and currently the demo is only in Spanish with English subs (something I actually felt enhanced the experience), however Kellner confirms that the game will have English voice-acting with the team recently finishing the English scripts and on the hunt for the right artist. There’s no doubt that Etherborn is a labour of love, and it seems their hard work is paying off too, with the game collecting numerous awards at various events. And after my hands-on with the game’s demo I echo those sentiments, as the game is a beautiful, unique and well-crafted puzzle experience. However, despite all the accolades, the team at Altered Matter are keeping their feet on the ground. ‘We are under no illusion as to just how many games are out being created by immensely talented people’, Massó states. ‘For our work to be considered something worth talking about and giving prizes to kind of comes a bit a jolt to the system. A good one of course, but it’s still all rather new to us’, he continues. However, it is positive reinforcement for the studio knowing that their work is being enjoyed. ‘I guess when you work on something for so long, day after day, it’s easy to lose sight of any sense of achievement or pride’, Massó explains. ‘To have people tell us that we have something worth talking about, it helps to keep us going’. The studio has funded a lot of the game with their own savings as well as loans and grants from the government, and recently Humble Bumble jumped onboard and are funding part of the game. But as Kellner says, ‘making games is sadly quite expensive’, and in order for Altered Matter to release Etherborn on all four platforms they’ve had to turn to crowdfunding for additional financial support. But instead of turning to the popular Kickstarter or Indiegogo platforms, Altered Matter are running their crowdfunding campaign on the Fig platform. ‘We wanted to try something that is a little different, is less cluttered and hasn’t been used by hundreds of developers before us’, explains Massó. ‘Plus Fig comes across as a lot more curated, and we thought that being selected meant it distinguished our game a bit from the flood of other crowdfunded games’, he continues. Unlike Kickstarter and Indiegog, Fig actively works with developers every step of the way and allows potential investors to back a game’s development and share in the game’s spoils once it’s released. It’s a unique platform, but one that many big-name industry people are involved in, such as Randy Pitchford (President, CEO and Co-founder of Gearbox Software). ‘Collaborating with Fig means that we also receive feedback from their team, helping us shape the game and our message more clearly to reach our audience’, states Massó. ‘On Fig showing what makes you different is more valued as often the people investing have an understanding of the market and can see where your game fits in’, he says. The unfortunate reality of crowdfunding is that not all campaigns are successful, and at time of writing the Etherborn campaign sits at 78% funded ($23,598 of $30,000 goal) with the campaign set to end on June 8. While the signs point to the campaign being successful, developers have to have a plan B in case things don’t work out. ‘We’re hoping it doesn’t come to that’, says Kellner. ‘Realistically, we’d need to revise the level of polish we can afford and the launch date for consoles. We’ve already been doing some work on consoles, but many aspects of it (especially testing) are pretty resource consuming. If the campaign fails, we would focus on the PC version only and have to rethink what we could do for console’, he explains. If you’re a fan of puzzlers, platformers or hybrids of both, I cannot recommend you check out Etherborn’s Fig campaign enough. Several WellPlayed members have backed the project, and as a backer I really hope the campaign succeeds as not only do I want the game on console, but I want as many people to experience Etherborn as possible. I look forward to cracking a few Foster’s and testing my skills when it launches in Q4, 2018. To back Etherborn on Fig click here. Otherwise for more info on Etherborn check out Altered Matter’s official website.